It’s a surname name with ties to the evergreen Charles. 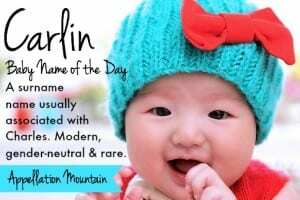 Thanks to Emily for suggesting Carlin as our Baby Name of the Day. In Irish, it comes from Caireall, the name of a fifth century Irish saint, sometimes said to mean warrior. In Swedish, it comes from Charles via Karl, the common form of the name throughout Scandinavia. It’s related to Charles in French, too. Several places called Karl- this or that in Germany could also have inspired the surname. File this one under pan-European possibilities. Or you could invent Carlin, from Carl, Carla, and Carly, just add -lin. The name was first given to five or more children in 1905, when Carlin debuted on the boys’ list. Five girls were given the name in 1920. Usage remained steadily gender neutral. In 1950, 17 girls and 17 boys were given the name. Most years, Carlin was given to a few more boys than girls. But not always, in 1970 there 16 girls, 15 boys. In 1990 there were 45 girls and 46 boys. The name peaked around the 1990s, and has declined slightly since. There were 24 girls named Carlin, along with 29 boys, in 2014. Carlyn, Karlyn, and Carlynn are almost exclusively used for girls. Carlyn and Karlyn peaked in the 1990s, but Carlynn’s highest year of use was 2014, when it was given to 24 girls. Karlin is rare, but is evenly given to girls and boys. There’s also Karlynn, which was given to 11 girls in 2014 – and first used back in 1948. It’s a longer history of use than you might expect. John Carlin, a painter and poet from the nineteenth century. Carlin was born deaf and mute in an era when educational options were limited. Carlin later encouraged Edward M. Gallaudet to found the school that became Gallaudet University, and received the first degree ever granted by the school. The portrait is of his daughter Frances. Comedian George Carlin hit it big in the 1970s with his NSFW humor. Later in life hosted the American version of Thomas the Tank Engine. TeenNick aired South of Nowhere, about the fictional Carlin family, from 2005 to 2008. Actress Carlin Glynn won a Tony Award in 1979, and had roles in 80s movies like The Trip to Bountiful and Sixteen Candles. The Bates, a mega-family featured on UP TV’s Bringing Up Bates, includes daughter Carlin, #9 of nineteen. There are handful of others, too, including an academic and a few male athletes. There’s a quirky twist – or two! – to this name. The Carlin Gold Trend is one of the the world’s richest deposits of gold. It’s found in Nevada, and runs under a town called Carlin. It’s produced over 70 million ounces of gold in the twentieth and early twenty-first centuries. Then there are Carlin Stones, found throughout Scotland. It’s not clear how the name evolved, but one guess ties it to the Gaelic word for a witch or a hag – Cailleach. All of this makes Carlin an interesting possibility. It could serve as an unconventional way to honor a beloved Charles, or anyone with an associated name. And while Carlin feels sleek and modern in some ways, it’s also interesting to note that most Carlins are teenagers – or older. Overall, it’s a rarity that would wear well, for a son or a daughter, in 2015. What do you think of Carlin? Do you like it better for a boy or a girl? My name is Carlin, I’m female, I’ve found the origin and historical points in the article very helpful! I don’t dislike my name given its rarely picked for girls. I think its modern and gender- friendly but also powerful for females! My nickname is Calla which gives a soft ring to it. thanks for the thorough description it’s been the first one I’ve come across on the web! The only association I have with the name is George Carlin, so it strikes me as sort of surly. I’m pleasantly surprised to learn about its long history! 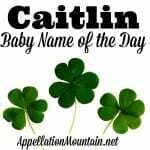 We’ve planned on using Carlin as a middle name for a son, after my husband’s grandmother Carline [car-LEEN], several family members named Charles, and myself [since my mn is Lynn].